There was an interesting article in The Guardian yesterday about the campaign to save one of the original homes of American popular music, Tin Pan Alley. 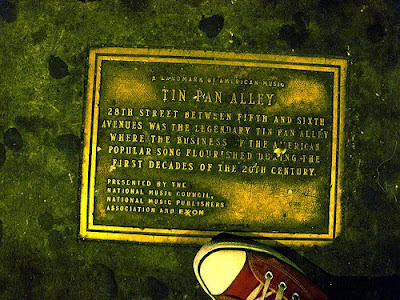 Located on West 28th Street just off Broadway in Manhattan, New York, Tin Pan Alley was the name given to a row of buildings that collectively became the epicentre of the sheet music business and the place where the modern music industry was born. It's all said to have started back in approx. 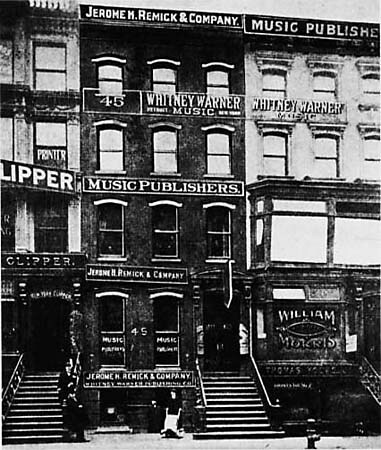 1885 when many music publishers set up shop on the street. 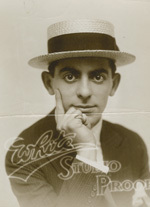 The shops would be bustling with pianists and singers sometimes employed by the shop or by publishers to demonstrate songs to promote sales of sheet music. Aspiring singers and songwriters would visit the street to play their songs in the hope a publisher would want to buy them. I can only imagine how alive with music this little street must have been back then, in fact many historians believe this is where the name 'Tin Pan Alley' comes from, the sheer noise made by so many pianos being played at the same time sounding like tin pans being banged together. Technology advances changed the distribution mechanism of the music industry and during the 1930's sheet music was competing with the phonograph and radio. Gradually the shops of Tin Pan Alley closed and the street drifted into decline. Nowadays the only evidence to suggest this was once a bustling hub of music is a small commemorative plaque on the floor. In October of this year, the original buildings were put up for sale and are under the threat of demolition to potentially make way for an office block. How exciting it must have been to have visited Tin Pan Alley back in its day. A street buzzing with musical energy, the place to be if you were a musician. Imagine all the characters who would have worked there, the possibilities, the discoveries, the arguments, the competitions and of course the noise! If I could be transported back in time, this would be one of the places I would choose to go. I really do hope demolition can be avoided. This blog seems to well versed in not only the history of this historic street but also the status of the sale.